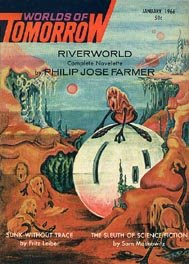 Philip Jose Farmer, who recently died, had a successful series of sci-fi stories based on a river that wrapped around the Earth, with sheer cliffs on all sides so nobody could ever leave. The inhabitants were everyone who ever died on Earth. The series was loosely called Riverworld and consisted of five novels and a handful of short stories. One short story called simply "Riverworld," often cited as an important contribution to the genre, is about Tom Mix. He's a muscle-bound cowboy movie star from the early 1900s (pictured, right) and also one of the characters on the cover of Sgt. Pepper's Lonely Hearts Club Band. Mix's friend is "Yeshua," who is basically Jesus and refuses to participate in the violent war taking place around him. The story, really a novella, ends predictably. I was exited about reading the full series, which has such a promising premise, but I'm pretty discouraged by Farmer's wooden characters, sometimes seemingly confused plot lines, and occasionally anti-Semitic leanings.